WP Fusion includes a few shortcodes to make it easier to manage your content. Any field listed in the Contact Field tab of WP Fusion’s settings can be accessed in this way. This will output the date like 2019-03-10. This will output the date like Friday the 22nd of March, 2019. For more information on the syntax see PHP’s date documentation. If you’re using the Gutenberg editor, check out our Gutenberg block. To restrict content based on a user’s CRM tags, wrap the desired content in the WP Fusion shortcode, using the examples below. Note: By default, WP Fusion will only unlock the content if the user has all of the tags in the list. To make it so that the content will unlock when any of the tags are found, include method="any" in the shortcode. This will show to everyone who doesn't have the "New Customer" tag, including logged out visitors. Shows to all users who don't have the "New Customer" tag, as well as logged-out visitors. 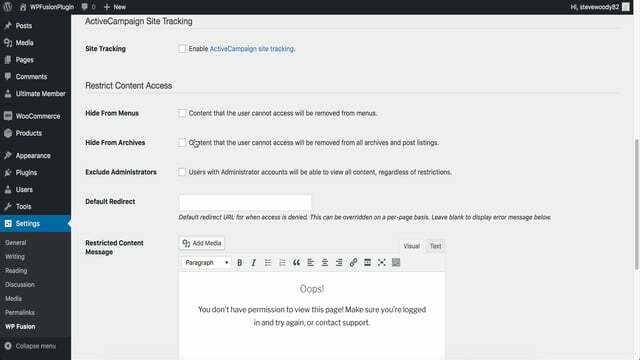 You can insert a shortcode into your pages to force an update of a users tags and/or meta data before the rest of the page is displayed.